A howling melodic savant with four haphazardly held distorted power chords and some thunderous drums not only started a musical revolution, he also instantaneously solidified the identity of a city. The year was 1991, and Nirvana’s “Smells Like Teen Spirit” had just dropped on Seattle with intense clarity, wiping away the over-the-top ’80s rock acts and leaving waves of sound and attitude that can still be felt today. Emerging from a vibrant local punk scene bred on Sub Pop Records, the grunge movement soon became the predominant national noise, and Seattle served as its epicenter. Seattle-born groups like Pearl Jam, Alice in Chains, and Soundgarden followed in Nirvana’s footsteps and blossomed into massive rock bands on a global scale. 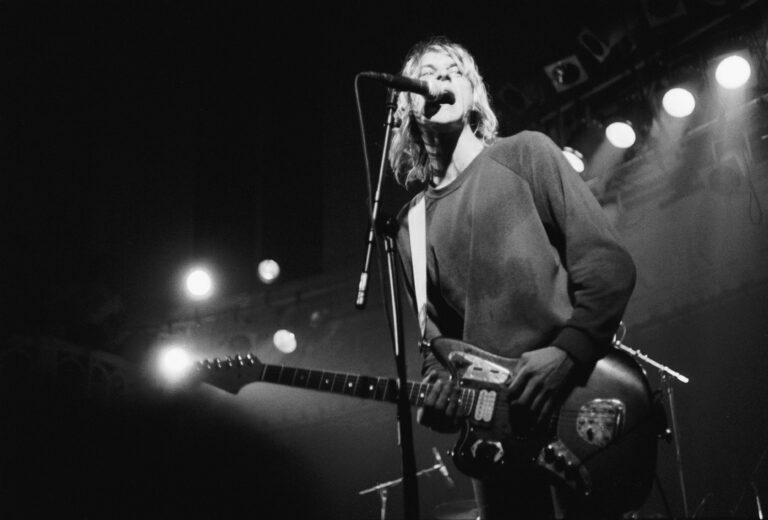 But the story of Seattle music doesn’t begin and end with Kurt Cobain and his grunge legacy. After all, the city has nourished everything from jazz kings to hip-hop superstars and is now at the forefront of the indie-folk movement. That plethora of musical talent—not to mention the wealth of ways to consume music, from intimate concert venues to mom-and-pop record shops—speaks to one clear, guiding thought: Seattle is musical nirvana. In the aftermath of World War II, jazz was jive, and Seattle served as a prominent Northwest outpost. The many jazz clubs of Jackson Street made it the liveliest spot in town, and venues like the Black and Tan Club and Showbox Ballroom (still operating as The Showbox) hosted stars like Duke Ellington, Count Basie, and Louis Armstrong. Ray Charles spent a spell living and performing in Seattle during that time, where he met a promising young Garfield High School trumpeter by the name of Quincy Jones. Of course, young Jones grew up and went on to win 27 Grammy Awards and produce three Michael Jackson albums, including 1979’s Off the Wall and 1982’s Thriller. The 1960s saw a brief garage rock boom, and its roots can be traced directly back to the Pacific Northwest. In May 1963, Seattle-based label Jerden Records released a single from The Kingsmen covering “Louie Louie.” After being pushed on area radio stations, the song became a smash hit all across the country, but the garbled lyrical delivery led the FBI to investigate if it was obscene. Naturally, the controversy only furthered the song’s popularity. This version is still considered a milestone in garage rock today. 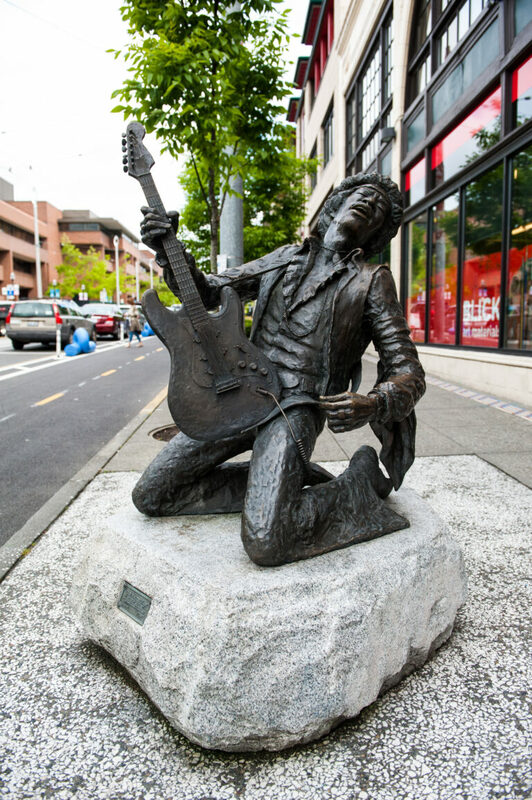 When it comes to classic rock, Seattle boasts a few significant claims to fame. The first, of course, is the greatest guitarist of all time: Jimi Hendrix. The legendary musician was born in Seattle in 1942 and learned how to play guitar while growing up in the city. He moved away before achieving stardom, but he’ll always be the pride of the Emerald City. Visitors today can see Hendrix strumming his heart out in the Capitol Hill neighborhood, where a statue immortalizes him in bronze. 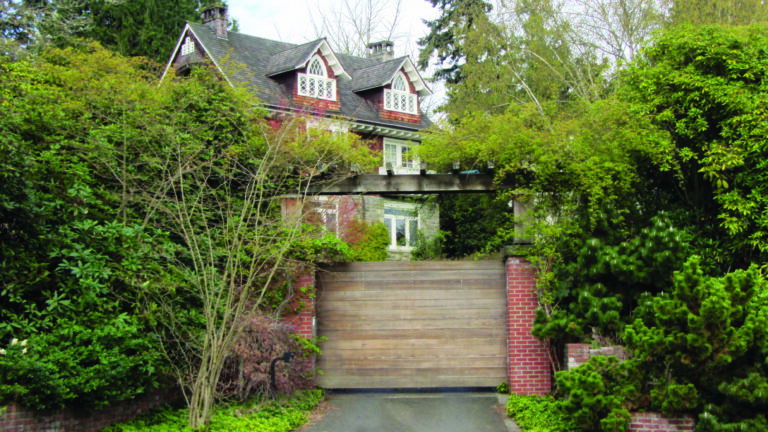 For legendary rockers that stayed anchored in the Seattle area, look no further than sisters Ann and Nancy Wilson. Heart broke into the rock-and-roll boys club in the mid-1970s with music that was harder and heavier than anything out there—and sold millions of records in the process. And for musicians who found their way to Seattle later in life, well, just take a look at Dave Matthews. The South African band lead has musical roots in Virginia but now calls Seattle his home, where he’s been spotted shopping for groceries and having a drink at his neighborhood pub. As heavy metal riffs of the ’70s and ’80s gave way to the growling grunge of the ’90s, hip-hop edged its way into the local music scene. The city found itself on the cutting edge in 1980 when DJ Nasty Nes debuted Fresh Tracks, the West Coast’s first hip-hop radio show on KFOX 1250. A dozen years later, armed with 1992’s booty-centric megahit “Baby Got Back,” Sir Mix-A-Lot emerged as the first Seattle hip-hop star. Local talent began to make waves again in 2002 when the social-minded rap duo Blue Scholars came onto the scene, quickly becoming hometown heroes. Otherworldly experimental hip-hop duo Shabazz Palaces brought national respect to Seattle with the acclaimed release of 2011’s Black Up. All of this paved the way for Macklemore and Ryan Lewis to become international superstars. After building up a rabid Seattle following, the pair blew up in 2012 thanks to the playfully colorful single (and Seattle-filmed music video for) “Thrift Shop” from the album The Heist. The independently released record went on to sell more than a million copies and earn the duo four Grammy Awards. It took a while for a new Seattle rock sound to crystalize post-grunge, with some standouts like The Presidents of the United States of America dabbling in alt rock stardom, but in the early 2000s indie rock bloomed. Modest Mouse, with its 2004 Grammy-nominated album Good News for People Who Love Bad News, and Death Cab for Cutie—known for 2003’s Transatlanticism and 2005’s Plans—brought a brand of emotionally honest underground music to the masses. They were followed by a wave of local indie-folk acts like Fleet Foxes and The Head and The Heart, which found national success and inspired a slew of followers that flooded Seattle venues. These days, there are a variety of music scenes thriving in town. Drawing inspiration from the ’90s riot grrrl movement that rose up in the state capital Olympia, there’s an amazing crop of feminist punk bands including Tacocat, Chastity Belt, Childbirth, and Mommy Long Legs. Women have a strong voice in the scene in general, with other fantastic rock acts like Deep Sea Diver, Lemolo, Wimps, and surf-rock band La Luz, which is earning praise for its beachy tunes with doo-wop flair. On the electronic music front, Odesza has ridden its chill waves to become that national face of a growing EDM community. The singer-songwriter trend has long excelled here as well, with plenty of room for the veterans like Damien Jurado, Brandi Carlile, and David Bazan to do their thing, while younger talents like Noah Gundersen, Kris Orlowski, and Shelby Earl also shine. That support for homegrown talent is, perhaps, the greatest achievement of Seattle’s music scene. For everyone from jazz musicians to wailing rock singers to guitar-toting folk artists, there’s an undercurrent of local support and a thirst for music that never wavers. Everyone is welcome to come as they are. On Record: Find CDs and vinyl at music shop mainstays Sonic Boom, Easy Street, and, for those traveling by air, Sub Pop’s store at Sea-Tac Airport. Along with its fount of musical talent, Seattle’s abundance of superb concert venues helps make the music scene truly vibrant. Run by the nonprofit Seattle Theatre Group, the city boasts three major historic theaters—The Paramount, The Moore Theatre, and Neptune Theatres—all offering world-class concert experiences. In the shadow of the Space Needle, KeyArena serves as the go-to spot for touring superstars to put on arena concerts, while the biggest names occasionally head to CenturyLink Field and Safeco Field for outdoor stadium shows. In addition to the aforementioned Showbox (which has two locations in town), Neumos and The Crocodile offer perfectly sized stages for touring acts and the most popular local groups. Chances are, if a band has performed at one of these spots, it’s well on its way. Meanwhile, top-notch neighborhood venues strike the perfect balance of intimate environs and killer acoustics. Some favorites include Tractor Tavern (Ballard), Nectar Lounge (Fremont), Chop Suey (Capitol Hill), and Columbia City Theater (Columbia City), each adding different flavor to the scene. Aside from a host of concert halls, any good musical city needs great festivals. During Memorial Day weekend, Northwest Folklife Festival takes over Seattle Center for a free celebration of ethnic music, with a dose of modern folk and rock sprinkled into the mix. The ultrahip Capitol Hill Block Party brings the freshest and most buzzed about indie rock and electronic music to the neighborhood’s streets each July. And Bumbershoot descends on Seattle Center every Labor Day weekend for days of stages packed with the biggest names in music, along with some local favorites. Press Play: Want to hear Seattle artists in action? Listen to a playlist of local tunes on Pandora.